Growing construction market, expansion of metros & airports, construction of new hotels & malls along with growing metal & mining sectors are some of the key factors which have fuelled growth of the construction equipment market in Saudi Arabia. However, the market declined majorly in 2015 & 2016 due to slowdown in the construction sector. The slowdown was recorded owing to lower government spending on account of declining oil prices which halted or delayed several infrastructure projects. According to 6Wresearch, Saudi Arabia construction equipment market size is projected to grow at a CAGR of 3.1% during 2017-22. Though, the market declined in last two years, but is anticipated to bounce back post 2018. In 2016, earthmoving equipment captured major share in the overall market followed by material handling equipment and cranes. Amongst all the verticals, the construction vertical accounted for key Saudi Arabia Construction Equipment Market Share and is expected to dominate in the forecast period due to growing investments in the country. The Saudi Arabia Construction Equipment Market report thoroughly covers the market by construction equipment by types, by verticals and by regions. 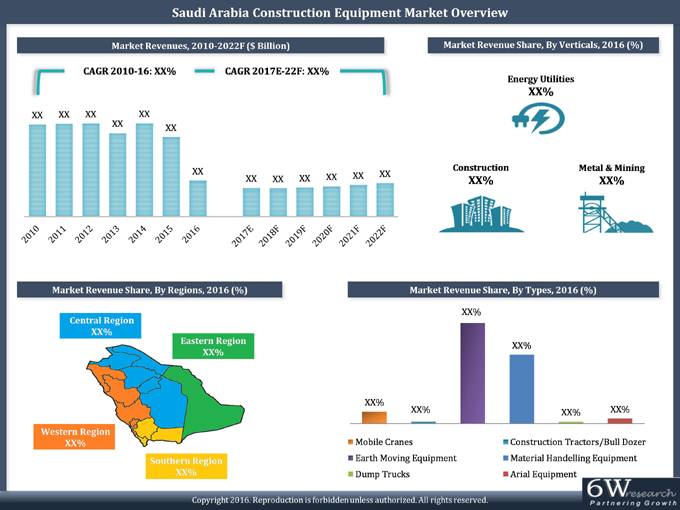 The Saudi Arabia Construction Equipment Market outlook report provides an unbiased and detailed analysis of the Saudi Arabia Construction Equipment Market trends, opportunities/high growth areas, market drivers which would help the stakeholders to device and align their market strategies according to the current and future market dynamics. • Historical data of Global Construction Equipment Market for the Period 2010-2016. • Market Size & Forecast of Global Construction Equipment Market until 2022. • Historical data of Saudi Arabia Construction Equipment Market Revenue & Volume for the Period 2010-2016. • Market Size & Forecast of Saudi Arabia Construction Equipment Revenue & Volume Market until 2022. • Historical & Forecast data of Saudi Arabia Mobile Crane Market Revenue & Volume for the Period 2010-2022. • Historical & Forecast of Saudi Arabia Bulldozer Market Revenue & Volume for the Period 2010-2022. Volume for the Period 2010-2022. • Market Size & Forecast of Saudi Arabia Construction Equipment Market Revenue & Volume by Vertical until 2022. • Saudi Arabia Construction Equipment Market Trends. • Saudi Arabia Construction Equipment Market share by Players. 16.4	Hitachi Construction Machinery Co., Ltd.